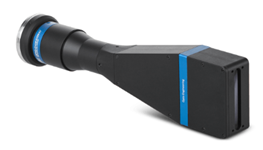 Telecentric lenses are the key component of accurate machine vision measurement systems. Unlike conventional lenses, optical magnification remains constant within the field of view and depth of field. This telecentric lens has been carefully designed for line scan cameras having an image circle up to 28.7 mm. Dimensional constraints are often a major issue when designing image scanning systems, especially those having multiple cameras. This lens's unique "flat" profile shrinks the inspection envelope. It enables the cameras and lights to be mounted in a smaller space. And, if space is still a problem, these lenses can be combined with our first-surface mirror assembly to fold the optical path. This telecentric lens includes both phase and focus adjustments. The phase adjustment allows the lens to be aligned precisely with the camera sensor, after the camera body has been mounted and the lens has been seated. Ask us about our compatible illuminators with matching flat design. This lens has a standard F mount for compatibility with many linescan cameras. The same lens with an M42 mount is readily available; additional mounts are available on request. The working distance (measured between the front of the lens and your object) should be kept within +/- 3% of the nominal value shown above for maximum resolution and minimum distortion. The f-number shown above is the “working” or “real” f-number of the lens when used as a macro. Please contact us if you need a lens having a smaller aperture.